These two black-headed gulls have got the chop within 25 yards of each other. The scattering of feathers suggest a violent death. I suspect a sparrowhawk, seen on the same day, is the culprit. 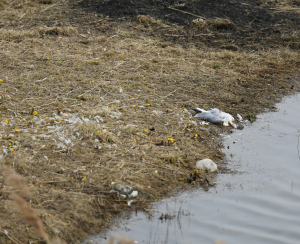 I haven't seen two corpses so close together very often, which led me to wonder if black-headed gulls might not be very tasty.